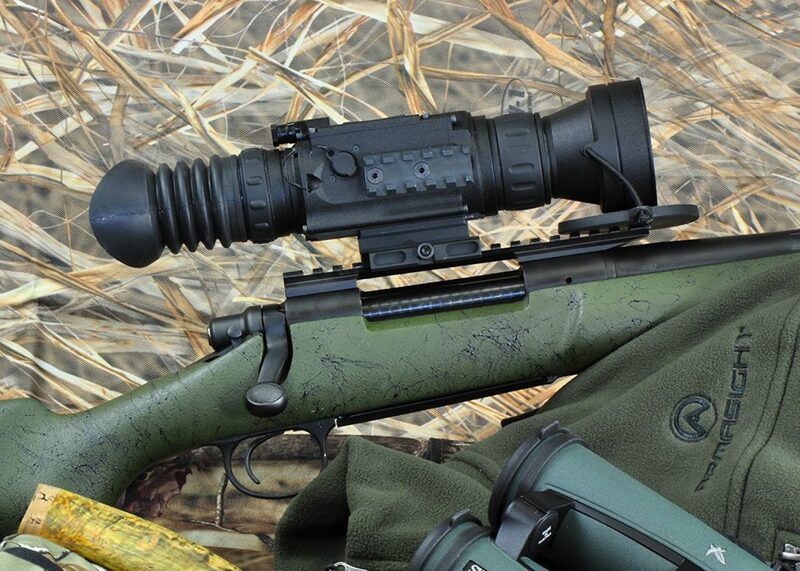 Thermal and night vision optics have been used by our armed forces for decades, and the recent uptick in hog hunting (best done at night, where legal) has seen these products trickle into the civilian market as well. Got $4,000 to drop on something you almost definitely won’t get $4,000 worth of use out of? Of course, as the technology that goes into these awesome devices gets cheaper and more manufacturers bring products to the market, the price drops accordingly. Yay, capitalism! Now, when I say the price drops I generally mean from “cheap used car” to “beat up used car”. These things are still expensive. 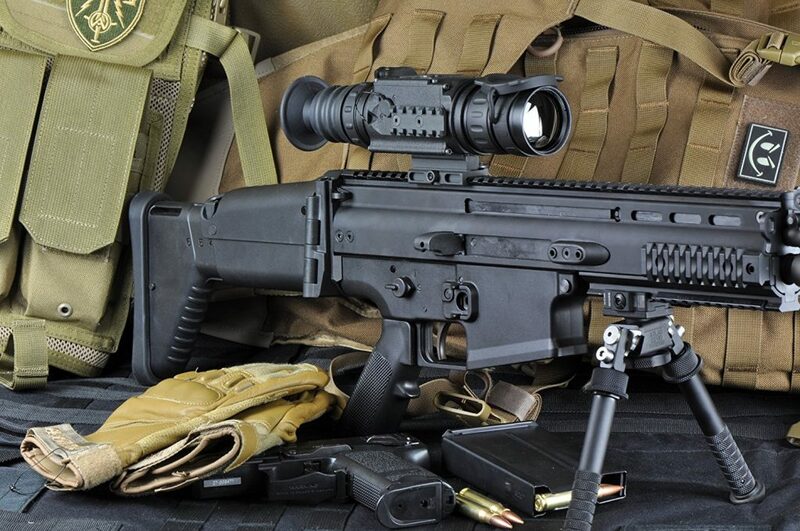 The Armasight Zeus up there clocks in at nearly four grand so it’s not exactly an impulse purchase, and it’s hard to justify buying something like that when it’s such a niche product. 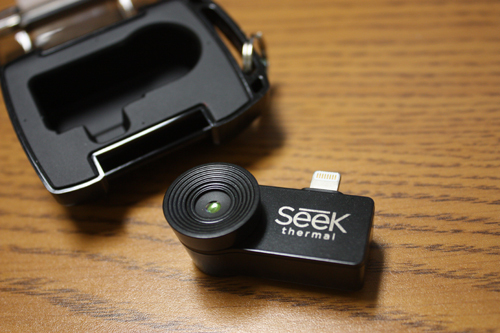 Enter the Seek Thermal Camera and the accompanying Inteliscope mount (and app). Together, these two products combine to make a perfectly serviceable, if less than military-grade thermal scope that you can absolutely use as a substitute (but not replacement) for the more expensive thermal scopes out there. And it does it by turning your phone into a thermal camera. How does it do that? Is it worth buying? Or is it just a gimmick? The Inteliscope Mount is a picatinny-compatible mount for your cell phone that lets you record some cool POV footage while also being able to use the phone as a rudimentary electronic sight. It also comes with a free app (available on Google Play and iTunes) that lets you use your phone screen and camera as a variable zoom optic, with quality depending on the quality of your phone camera. I know it looks silly, but stay with me for a second. Now, before all you serious oper8rs laugh and close this tab, wait a second. Is this thing as good as a purpose-built optic like a red dot? Even a good cheap one? Unequivocally, no. It’s just not. 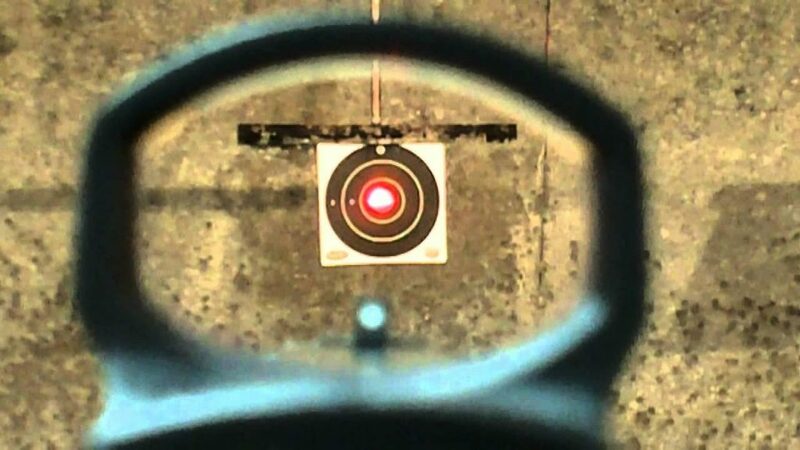 Breaking News: Red dot sights are better at being red dot sights than other things that are not red dot sights. Nothing that requires your to clamp your phone into a bracket and then sight in a dot on the screen every time is going to be as user friendly or effective as a red dot that’s designed to be a red dot. Don’t discount the Inteliscope mount just because it doesn’t work like a regular optic. It’s not a regular optic, and it has some pretty cool features that you won’t find at this price point anywhere else. First of all, it facilitates recording, which is great if you want to shoot some quick footage during a hunt or during a competition. YouTubers and gun bloggers rejoice! This mount is significantly cheaper than an action camera like a GoPro, and it uses a device 90% (or more) of us already have: our phones. Second, while it isn’t as user-friendly as a red dot, it does work as one. Granted, you’ll have to sight the thing in every time unless you’re willing to leave a phone in the mount forever, and I wouldn’t recommend putting it on a gun with more recoil than a 5.56, but you can absolutely reach out and hit 4 inch plates at 100 yards with this thing, and it’s more than adequate for close in work (<20 yards). Inside a home? No problem. Would I rather have iron sights in a defensive situation? Abso-freaking-lutely. That being said, this thing isn’t designed for defensive situations, outside of maybe one niche case I’ll go over later. For playing around at the range, or for running as a side-mounted camera this thing is more than adequate. The app is surprisingly good for an app that turns your phone into a rifle scope, and it was able to reach out to a respectable distance with it. Now, let’s talk about the Seek thermal camera. Seek Thermal Camera with case. Alright, this thing is cool. Most of my gun-toting generation has had at least some fascination with thermal optics since Call of Duty: Modern Warfare came out. 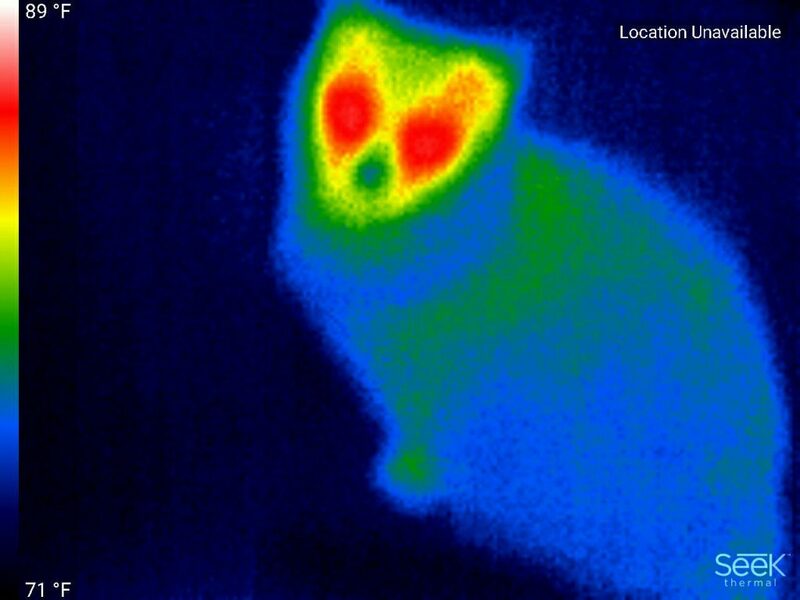 For under $300, you can turn your phone into a budget thermal imaging device, and with purpose-built devices running easily twice that, this is nothing to sneeze at. This camera was originally designed to help HVAC personel find leaks and other issues in duct work and other parts of a system, and just poking it around my apartment’s terrible ductwork, I can confirm that it will absolutely work for this purpose. But there’s so much more you can do with it. Wanna win every nighttime game of hide and seek ever? Boom. Wanna see what exactly is making that scratching sound outside your window, be it squirrel or serial killer? Done. Now, combining the two, and the Inteliscope mount has a slot and cable specifically for using the Seek camera, you get a rough-around-the-edges thermal scope that you can mount on anything with picatinny rails. Yeah, But Does it Actually Work? For spotting critters in the backyard, or hunting my cats through the apartment at night with a nerf gun, this thing is the tops. It’s a fun little toy, and it does precisely what you expect it to do. Well, as long as we have reasonable expectations of strapping a phone to a rifle, shotgun, or bow. Pepper never stood a chance. As far as durability, the mount is very solid. At no point was I worried that my phone was going to fall out. The fact that you’re using a phone does present some issues though. First is battery life. I don’t know about you but the coin cell in my red dot will last for literal years, provided I remember to turn it off in between uses. My phone on the other hand, struggles to make it through a full 18 hours of heavy use without needing to limp to a charger. Second, your scope is only as durable as your cell phone. I’ve watched many an expensive smartphone fall a pathetically short distance just to end up with a shattered screen. As Eric helpfully showed in his Aimpoint Pro review, you can smack a modern optic with a hammer and it’ll keep zero and keep on trucking. Hammer torture testing of the Aimpoint PRO. Wait for the full results at pewpewtactical.com! 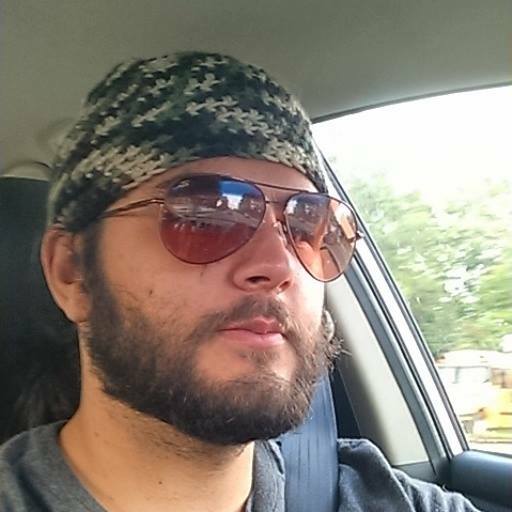 @aimpointusa . . Follow @pewpewtactical for more! Of course, you can mitigate this issue by having a case on your phone, but that exacerbates another problem this setup has: losing zero under recoil. Any extra material, particularly the soft, silicone rubber sections of say, an Otterbox case, will cause issues getting the clamp tight enough to avoid slight movements under recoil, or if you bump the phone or mount (as you almost certainly will if you’re moving around in the dark). I let loose two quick mags of .300 Blackout and that was enough to cause the sight to lose its zero a little and start to drift. For any kind of high-volume fire, or for use with a heavily-recoiling weapon, this is definitely going to be a problem. Other than that though, the damn thing does work, and it is damn cool. Is it a viable optic though? If you’re looking for something you can look through to shoot a living target in pitch black conditions…this isn’t what you’re looking for. I’m sorry to say, the types of optics that let you do that type of thing, whether for legal night hunting or home defense or military matters, are still really freaking expensive. If I had more money, I’d still be poor, but I’d have more stuff like this. However, if you’re looking for a really cool range toy, and a way to say, show that armadillo that’s tearing up your backyard who’s boss? Look no further. Make no mistake, the mount is great for recording fun clips at the range. The camera is a fun novelty that does have some practical use. Together, they make an almost serviceable optic. If that’s enough for you, buy it. It’s a really fun thing to have. But if it’s not enough, I have one more thing that might sway you. It makes a great reconnaissance tool. Allow me to paint you an imagination picture with my mind brush. Pretend you’re at home, at night, and you hear what sounds like something breaking at the end of the hallway. Being a good, God-fearing, gun-owning American, you have to go check, just in case. 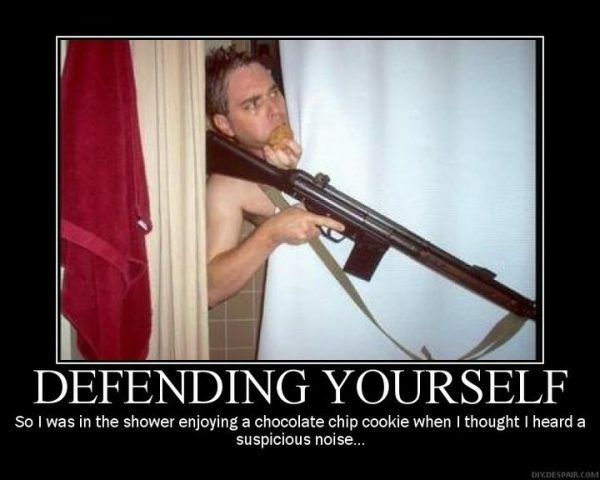 Or maybe you’re in the shower, enjoying some delicious baked goods. There are a few options here, since you can’t just run through your house blasting at anything that moves without identifying your target. That’s a recipe for an angry letter from your HOA at best, and tragedy at worst. So, what do you do? One, you can turn on every light in the house, but all you’ve done at that point is level the playing field between yourself and an intruder while also giving away your position. Two, you can use a weapon light, which is probably your primary option right now. 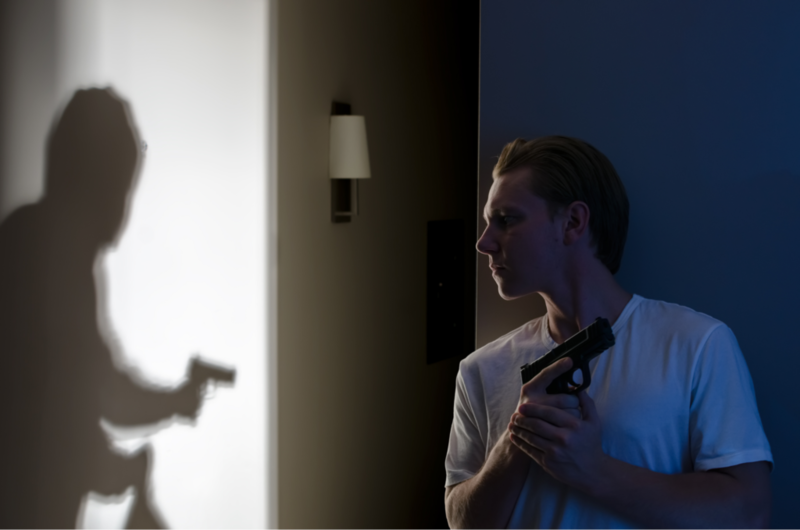 I have many a handgun, and not a few shotguns and rifles, with flashlights that put out some silly number of lumens and can not only light up your house, but can also blind and disorient an intruder. This of course still gives away your position to an extent and is why all my long gun-mounted lights have momentary-on remote switches. Think you see something worth investigating, flip on the light, flip off the light or perforate with buckshot as necessary. Problem solved. But now there’s another option that, in certain situations, is even better. 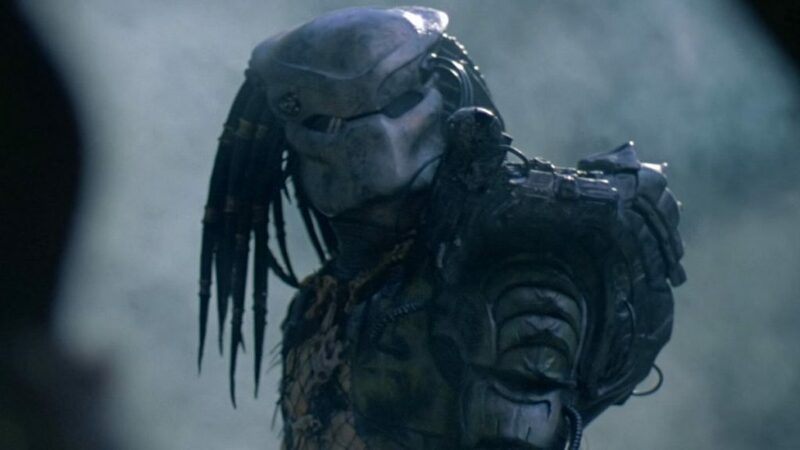 Imagine hearing a bump in the night and going to check, but this time you’re moving in total darkness like the freakin’ Predator because you can see in infrared. You can easily have this thing mounted on a side picatinny rail and move around with complete confidence that you can see an intruder well before they can see you. This is obviously a huge tactical advantage. Of course, there’s another advantage as well. 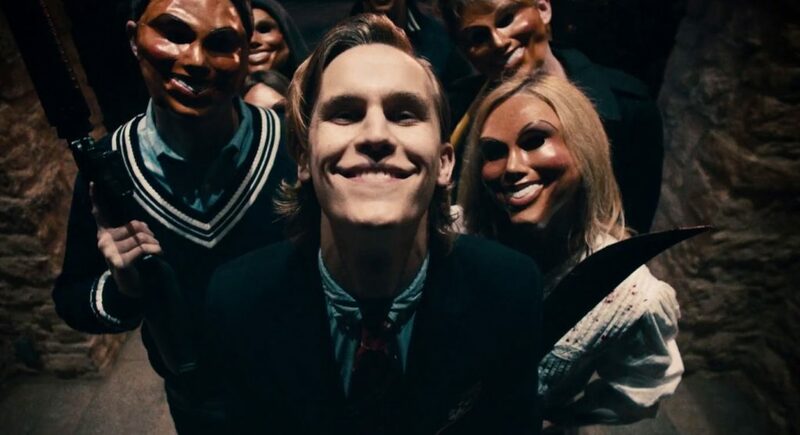 For most of us, the chance that a breaking sound in the middle of the night is just a child, other family member, or pet is much, much higher than the chance of it being someone reenacting the Purge movies. This type of scenario is, statistically, unlikely. Personally, I’d rather see that it’s my dog on the thermal scope and immediately lower my weapon. And I’m sure your kids can do without breaking a vase and then seeing Mommy or Daddy point a gun at them in the middle of the night. 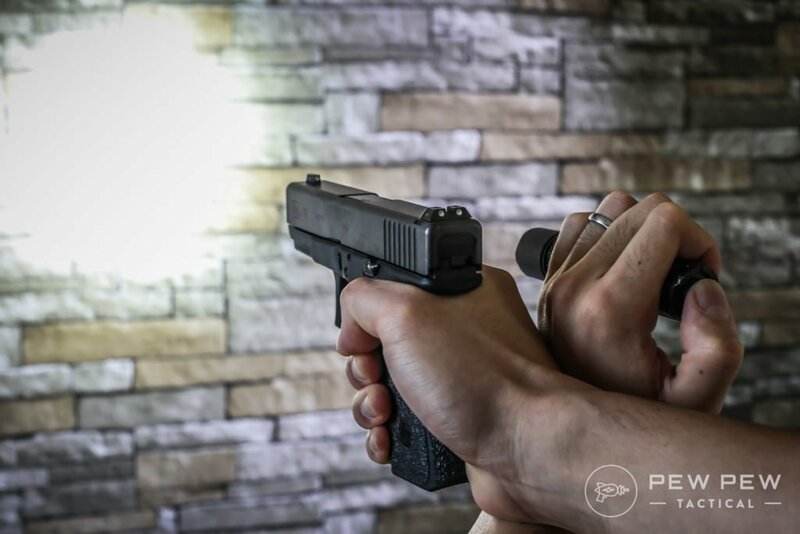 With a thermal camera, you have an extra level of safety and target identification at night, and it’s less likely to scare the hell out of your family like suddenly being bathed in the harsh white light of an LED weapon light attached to a rifle will. It’s a niche case, but something to think about. Beyond the practical implications though, this thing is just freaking fun. It’s a joy to play around with, and is totally adequate for doing a little pest control or plinking in the dark. I don’t know that I, personally, would be brave enough to do a night hog hunt with one, but I lost a fight with a 150lb boar as a child, so hogs and I don’t get along well at the best of times. I did bring it along on a deer hunt though, and I did use it to find a few drops of blood pretty easily, and eventually found the deer almost entirely with the thermal camera. Could I have found the deer with just a flashlight? Yes. Did I hum the Predator theme the entire time and generally have the most fun I’ve ever had tracking a downed deer? Absolutely. For me, that’s worth it. 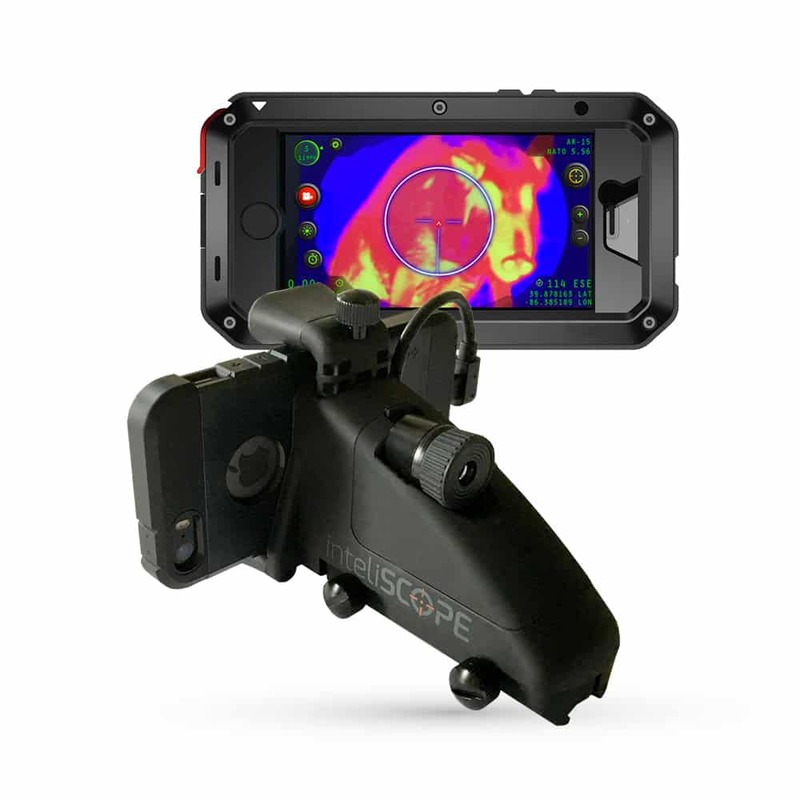 Again, you’ll need both the mount, the Seek Thermal Camera, and oh…the free app. For what it is, and the price it sells for, I think it’s absolutely worth the money if you’re looking for something new and fun to tinker with, or something to make the occasional sweep and clear of the ole homestead a little easier. What do you think of the Seek Thermal Camera and Intelliscope Mount? Let me know in the comments below!